Two committee chairmen from the Texas House of Representatives were defeated in Tuesday's Republican primary runoffs, dealing a small victory to anti-establishment conservatives frustrated with the leadership of the lower chamber. 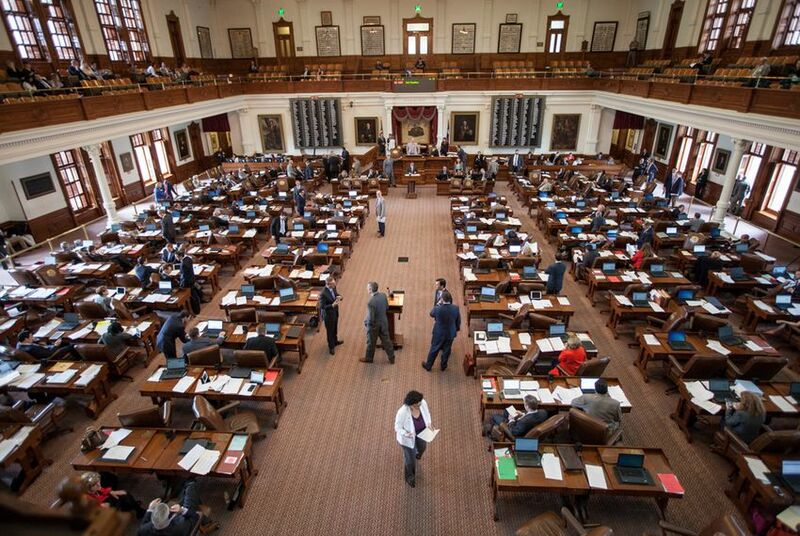 Two committee chairmen from the Texas House of Representatives lost their seats in Tuesday's Republican primary runoffs, dealing a small victory to anti-establishment conservatives frustrated with the leadership of the lower chamber. State Rep. Doug Miller, R-New Braunfels, chairman of the House Special Purpose Districts Committee, lost to Fredericksburg hardware store owner Kyle Biedermann 55 percent to 45 percent, with Biedermann earning 10,481, votes to Miller’s 8,438, according to complete but unofficial returns. Meanwhile, Rep. Wayne Smith, R-Baytown, was defeated by Deer Park attorney Briscoe Cain by less than half a percentage point — 23 votes. Cain ended the night with 3,045 votes to the incumbent’s 3,022. A recount is possible in that race, although Smith has conceded defeat. "It has been my distinct honor and high privilege to have served the hard working men and women of District 128," Smith said in a statement. "Mr. Cain will now enjoy that same honor." The two victories likely won't affect House Speaker Joe Straus' hold on the 150-member, GOP-dominated chamber. Enough Straus supporters won their primaries in March that it's unlikely that a serious challenge to his leadership will emerge. But the defeats of Miller and Smith serve as energizing wins for anti-establishment conservatives, who have said that Straus is too moderate and needs to be unseated. "We were outspent 6 to 1 and our opponent nearly spent $2,000,000," Biedermann said in a statement. "It was a tough fight, but this fact also means that I do not owe the Austin lobby, the entrenched interests and the capitol power brokers anything when I arrive in Austin." Biedermann's race was heated throughout. Pictures surfaced of him dressed as "Gay Hitler" in a 2008 charity fundraiser surfaced early in the race. During the runoff, he faced questions about a 16-year-old custody battle with his ex-wife, during which she received a court order requiring him to stay at least 100 yards away from their daughters. Biedermann produced statements from his ex-wife and children condemning Miller for raising the custody battle as a campaign issue, saying the issue was misrepresented during the legal fight. He later made the attacks a campaign issue of his own, sending out flyers to voters criticizing Miller for even bringing up the issue. "We thank the voters for seeing through the lies and embracing our issues based, conservative campaign," Biedermann said Tuesday night. Democrats, meanwhile, seized upon Biedermann's victory, saying the Republican Party had elected a "crackpot." "There can be no doubt, this is the Republican Party of Trump," said Texas Democratic Party Communications Director Tariq Thowfeek. In the GOP races for open seats, the mainstream Republicans fared well. Lynn Stucky, a Denton County veterinarian, defeated anti-establishment candidate Read King in the race to replace Rep. Myra Crownover, R-Denton. Coldspring rancher Ernest Bailes defeated attorney Keith Strahan, who had support from the anti-Straus crowd, in the race to replace Rep. John Otto, R-Dayton. And former Rockwall city councilman Justin Holland defeated John Keating by less than half a percentage point, winning the nomination to replace Rep. Scott Turner, R-Frisco. Meanwhile, the anti-establishment group scored a victory when Mount Pleasant businessman Cole Hefner defeated Jay Misenheimer. On the Democratic side, Rep. Ron Reynolds, D-Missouri City, won re-election despite a spate of legal problems. Last year, he was convicted of ambulance chasing — a case that's currently being appealed. And this year he was ordered to pay more than $500,000 to a former client, who sued him for malpractice for keeping her share of a settlement he helped her win in a civil lawsuit. Still, he defeated challenger Angelique Bartholomew 53 percent to 47 percent. And in the runoff for the San Antonio seat being vacated by Democrat Rep. Ruth Jones McClendon, businesswoman Barbara Gervin-Hawkins defeated activist Mario Salas.